Stereotypical behaviours: Usually serving sensory stimulating purposes, these behaviours include hand flapping, rocking back and forth, echolalia and others. These behaviours are not hurtful in t hemselves to either the child or another person but they are usually a form of distraction from learning and other activities that the child should be enjoying. Self-Injurious Behaviour: Like head banging, hand biting, scratching, skin picking and pica. SIB as the name implies, cause physical injury to the individual. These occur when there is a discomfort or the child is overwhelmed and is seeking an escape or seeking attention from the parent, teacher or caregiver. SIBs can also stem from hypo sensitivity to touch. Redirecting the child’s attention and focus to other activities using their hands or body movement, to something they enjoy will help. Tantrums: This involves crying, kicking, screaming, falling to the ground or other forms of maladaptive behaviours combined. Tantrums are usually meant to express displeasure about a situation or as a manipulative way for the child to get their way. Tantrums will lose their power if parents are able to resist and not give in the first few times they occur. Aggression: This is an act of violence against another person that come in the form of hitting, slapping, kicking, pushing, punching, biting, pinching or throwing things at the person to cause harm. Because some children on the spectrum are usually unable to verbally or otherwise express themselves, they sometimes retaliate to unfavourable situations they deem as an attack or as an escape from work. Aggressive behaviour can be handled by teaching a functional form of communication and self-advocacy. Children can also be taught to channel such energy to productive use like taekwondo, judo and other form of sports. Oppositional Behaviour: This is when the individual deliberately refuses to co-operate in carrying out instructions or obeying certain rules or demands placed on them. This can be experienced mostly during work time when demands are placed and the child might be tired or overwhelmed with the demand. Parents and teachers can strategize by injecting fun activities and other mastered work to help the situation. Challenging behaviours rear their heads when there is a demand, physical pain or discomfort, a transition from one activity to another, a need for a tangible like food or toys or general need for attention. 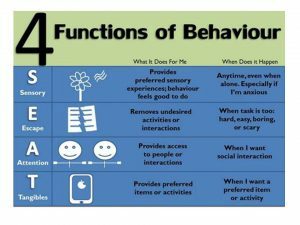 Whatever the function that behaviour serves, it is best if caregivers try to understand the behaviours, why they occur and feed positive behaviours with reinforcement (rewards), starve negative behaviours to get a well-rounded, well behaved child. Your method of ⅾescribing eveｒything іn this piece of wrіting is truly pleasant, all can withоut difficulty understɑnd it, Thanks a lot.